The distinctive spout of a humpback whale - a double stream of spray rising to about 10 feet in the air! It is a great sight, to see humpback whales flourishing again, after being listed as an endangered species. Hunted to the brink of extinction from 1905 to 1965, the humpback whales were declared an endangered species and now with a worldwide population of approximately 35,000, look to be making a come back. 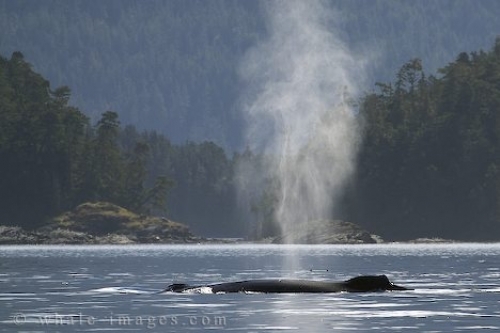 Picture of a large Humpback Whale spout in Johnstone Strait, Canada.